BERLIN - Goodwin College is taking a different approach to developing the manufacturing workforce with a mobile lab. 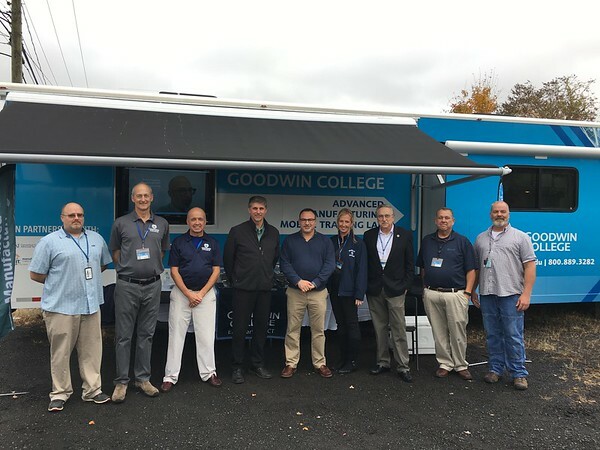 The Advanced Manufacturing Mobile Training Lab by the East Hartford-based school was in Berlin recently to give an open-house demonstration on the training services it provides. A 44-foot trailer is pulled by a school-owned tractor to the parking lots of various businesses so employees can receive training on site, vs. traveling to a school or conference. It also goes to high schools and middle schools to raise awareness of the manufacturing industry and career paths. The lab is touted as having all the makings of a full training facility for manufacturers with a wi-fi hotspot, smart boards and climate control. Inside is all the equipment necessary for a person to learn business management, technical, quality control and several other types of classes. Classes come in one four-hour session that can be done in a day, or two of them across two days, for up to 14 employees in each session, according to the lab’s website. There are also 45-hour extended workshops available for people to receive certifications. “They could walk in here and not even know how to use it,” said Pucino. A business could have a loading dock employee learn skills so they can run a computer, he added. That way, a business will need to then fill a loading dock position, not a more technical or operator position. All of this can come at no cost to a business, said Melanie Hoben, director of workforce development at the school. The lab has a deal with the state Department of Labor to have 50 percent of the costs, if a business meets certain criteria, reimbursed to the school. The school will use investment funds to cover the remaining 50 percent. “It was a success from our part,” said Scott Kirejczyk, vice president at EDRO, at the open house. The Berlin-based machine manufacturer had the lab come to his business last year to have all shop employees, a little over 20, receive training in metrology, blueprint reading and more for about a week. “Our employees gained some fundamentals that some didn’t have and others had reinforced through the process,” he added. The lab cost about $250,000 to make and has been going for about a year and a half through private donations and grants, said LaBella. Over 11,000 employees have been trained from almost 40 businesses, with some of those businesses returning and having learned from about 14 workshops with the school, Pucino said. For more information on the lab, contact LaBella at 860-727-6948 or glabella@goodwin.edu. Posted in The Bristol Press, General Business, Manufacturing on Monday, 12 November 2018 20:17. Updated: Monday, 12 November 2018 20:20.